AEP workers are shown repairing the damage at the substation on Dunlap Road on Saturday. A portion of the damaged substation is shown. 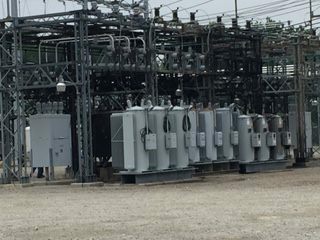 Nearly 6,000 Highland County residents were without electricity Saturday after AEP’s Dunlap Road substation suffered fire damage. AEP workers on site Saturday afternoon confirmed that most residents were likely facing a 24-hour outage. They said transformers that could be salvaged were being repaired, and other transformers would be brought in from elsewhere, possibly from as far away as Canton. Jim Lyle, director of Highland County Emergency Management Agency, said residents should be aware of refrigeration units that are without power for several hours. “Don’t open the freezer door every five minutes,” said Lyle. He said people should consider placing food in ice if the outage lasts as long as expected. In Hillsboro, most stores and businesses were closed. A long line formed at Holtfield Station, outside for gasoline, inside for food, as Holtfield continued operating with its own generator. Twenty-Four Exchange and Deli was doing a brisk lunchtime business, also operating with its own generator, although the clothing side of the store was closed. Lyle said Lowe’s was open. Bradley George, chief of the Paint Creek EMS/Fire District, said Paint Creek responded to the substation fire, but the fire had flashed quickly and was out on arrival. He said the cause of the fire was unknown. George said the outage was not affecting Paint Creek’s ability to respond to emergency calls, and portable generators were in place. Lyle said emergency calls should go to 911 as usual, but questions or concerns could be addressed by calling the local EMA at 937-393-5880.